Here is the list of the hotels near Herrin. Book your hotel near Herrin today, Thursday 09 May for the best price, reservation and cancellation free of charge thanks to our partner Booking.com, leader in on-line hotels reservation. Below here is the list the 50 closest hotels of Herrin, sortable according your criteria. You will find the position of these accommodations on the Herrin hotels map. Located in the countryside, surrounded by a Japanese-inspired garden Espace Zen'ing offers accommodation in Gondecourt with free WiFi and free private parking. Double rooms feature a flat screen TV and WiFi connection. The private bathrooms include a shower and toilet. The hotel also offers an apartment with a living room, kitchen, a double bedroom and separate toilet. Guests can enjoy a complimentary sweet breakfast is served in their room. Restaurants can be found 13 minutes' drive away in the nearby town of Seclin. A swimming pool, hot tub and steam room are also available on reservation with a preferential rate supplement. Guests can also request a massage in advance, subject to availability. The town of Lille is a 20-minute drive from Espace Zen'ing and the nearest airport is Lille Airport, 17 km from the property. Guest accommodation Annoeullin Preferred hotel ! Boasting barbecue facilities, La Chicorée provides accommodation in Annoeullin with free WiFi and garden views. Guests staying at this holiday home have access to a fully equipped kitchen. The holiday home includes 1 bedroom and a living room with a flat-screen TV. The property also has 1 bathroom with a shower, and free toiletries and a hair dryer are offered. The holiday home offers a terrace. Guests at La Chicorée can enjoy hiking nearby, or make the most of the garden. Lille is 24 km from the accommodation, while Ypres is 47 km from the property. Lille Airport is 24 km away. Located 7 km from Coilliot House, Queensland offers accommodation on a boat in Lille and features free bikes and a terrace. The boat has lake views. The bathroom features a bath or shower, while free toiletries and a hair dryer are also provided. A continental breakfast can be enjoyed each morning. Zoo Park of Lille is 8 km from Queensland. The nearest airport is Lille Airport, 16 km from the property. Auberge Nonque is located in Beaucamps-Ligny. It boasts free bikes, BBQ facilities and a garden.This property offers accommodation based on a sharing, recycling and sustainable concept. Free WiFi access is provided. All rooms are fitted with a balcony. Rooms are equipped with a private bathroom, while selected rooms will provide you with a patio and others also offer a city view. All guest rooms feature a desk. Guests at Auberge Nonque can enjoy a continental breakfast. The accommodation offers a children's playground. Hiking is among the activities that guests can enjoy near Auberge Nonque. Lille is 11 km from the guest house, while Ypres is 28 km away. Lille Airport is 14 km from the property. Bed and Breakfast Billy-Berclau Preferred hotel ! La Petite Cense is a B&B set in a small farmhouse located in Billy-Berclau. It features a floral garden and a continental breakfast with gluten-free produce is served every morning. Free WiFi access is available. With parquet flooring and antique furnishings, the rooms here all provide a flat-screen TV with DVD player and a fan. Facilities for making tea and coffee are provided. The modern bathrooms include a hairdryer. Free private parking is available on site. The B&B is 11 km north of Lens and a 25-minute drive from Lille, while Lille Airport is 18 km away. Le Nador offers guest accommodation located 8 km from Louvre-Lens, 20 km from Lille and its airport and 5 km from the A1 motorway. Homemade products are served for the continental breakfast every day. These unique rooms are decorated in an Oriental style with colourful fabrics. Free Wi-Fi, an LCD TV and welcome tray with products are provided and each room has a terrace with a garden view. A hairdryer is supplied in the bathrooms. Evening meals can also be prepared for you upon request. Free parking is available on site. Guests can receive a discounted price in a wellness centre just 1 km away. Hotel Englos Preferred hotel ! Located in the Loos district of Lille, Holiday home M’amour is a self-catering accommodation offering a terrace. Free WiFi access is available. This holiday homes with garden views features a bedroom, a living room with a flat-screen TV and a bathroom with a shower and free toiletries. The kitchen is equipped with an oven, refrigerator and stovetop. Meals can be taken in the dining area. Restaurants and supermarkets can be found in the surrounding area. Extras include outdoor furniture, barbecue facilities and a cardio training machine. Lille Train Station is located 400 metres from the property. This holiday home also offers free parking. Lilles Zoo is 5 km away, while the city centre of Lilles is 3.5 km from the property. Bed and Breakfast Salomé Preferred hotel ! Featuring free WiFi throughout the property, La Grange De Salomé offers accommodation in Salomé, 20 km from Lille. Rooms come with a flat-screen TV. You will find a coffee machine in the room. Every room is fitted with a private bathroom. There is a shared kitchen at the property. Ypres is 36 km from La Grange De Salomé, while Arras is 28 km away. The nearest airport is Lesquin Airport, 19 km from La Grange De Salomé. Apartment Lille Preferred hotel ! 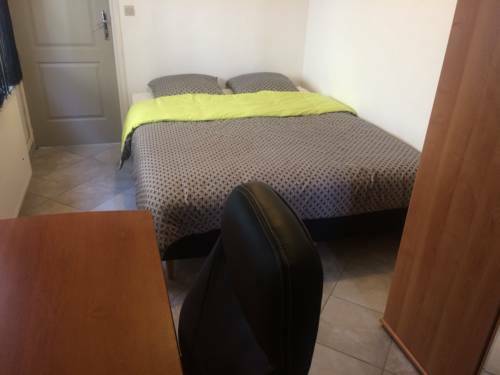 Situated 2.2 km from Braderie Lille and 2.2 km from Coilliot House, Residence Lille-Lambret offers studio accommodation in Lille, located in a student residence. The unit is 2.5 km from Zoo Park of Lille. There is a dining area and a kitchenette. Towels and bed linen are available in this apartment. Printemps Gallery is 2.9 km from Residence Lille-Lambret, while Hospice Gantois is 2.9 km from the property. Lille Airport is 7 km away. Le Colibri is located in Douvrin, just 10 km north of Lens and a 30-minute drive from Lille. It features a 24-hour reception, an on-site restaurant and free Wi-Fi access. The modern rooms at Le Colibri feature a flat-screen TV with satellite channels. Each one also includes a private bathroom, which is complete with a shower. You can enjoy the buffet breakfast every morning, either in the comfort of your guest room or in the dining room. There is also a bar and the restaurant serves gastronomic-style cuisine. Free private parking is provided on site and the A21 motorway is a 7-minute drive away. Other local attractions include the town of Béthune, which is 16 km from the hotel. Apartment Radinghem-en-Weppes Preferred hotel ! Offering free WiFi and garden views, Appartement Calme Et Lumineux is an accommodation set in Radinghem-en-Weppes. Guests staying at this apartment have access to a fully equipped kitchen. The apartment has a satellite flat-screen TV and 1 bedroom. The property also has 1 bathroom comes with a shower. Staff at the 24-hour front desk can provide advice on what to do in the area. A bicycle rental service is available at this property. Lille is 17 km from the apartment, while Ypres is 30 km from the property. The nearest airport is Lille Airport, 23 km from the property. HotelF1 Lille Englos is set in Haubourdin, in a commercial area situated a 20-minute drive from Lille. The rooms have a flat-screen TV. Some rooms have a private bathroom. For other rooms, guests share a bathroom with a shower. Guests can purchase microfibre towels at the hotel at an extra cost of EUR 3 each. A buffet breakfast is served every morning at an extra cost. A microwave is available in the shared kitchen. A bus stop is located in front of the hotel. Lens is 31 km from hotelF1 Lille Englos, while Kortrijk is 34 km away. The nearest airport is Lille Airport, 18 km from the property. Guest accommodation Lille Preferred hotel ! Situated in Lille’s Vauban district, 550 metres from Cormontaigne Metro Station, La Villa Carré offers a seasonal outdoor swimming pool, a terrace where guests can relax and a business centre. Built in 1932, it has an Art Déco style and free WiFi is available throughout the property. Each of the stylish rooms have a modern décor. All rooms offer an en suite bathroom with a bathtub or shower and some rooms have a view of the surrounding gardens. A homemade continental breakfast can be served each morning upon request and for an extra fee. It can be enjoyed on the terrace, or in the stylish dining area. In the evening, guests can relax in the lounge. Lille Grand Palais is 6 km away and Nouveau Siècle Convention Centre is 2.5 km from the property. Bed and Breakfast Lille Preferred hotel ! Located in the centre of Lille, next to the Réconciliation Chapel, Lille aux Oiseaux dates back to 1907 and offers B&B accommodation with a garden. Cormontaigne Metro Station is just 200 metres away. All rooms are decorated in a modern style and feature a view of the city, a wardrobe and parquet flooring, while one also has a balcony. The en suite bathroom includes a hairdryer, free toiletries and bathrobe. A breakfast is available each morning and can be enjoyed in the property’s conservatory or in the garden. Restaurants can be found within walking distance. There is a free access to the fitness centre. Additional features include free bikes and free WiFi access throughout. The property is 3 km from Lille-Europe Train Station and the Grand Palais. Paid parking is available according to availability and free street parking is available nearby. Deffrennes is a homestay set in Lille, 1.8 km from Coilliot House. Enjoy a cup of coffee while looking out at the garden or city. Rooms share a bathroom while some rooms are equipped with a private bathroom fitted with a bath or shower. Deffrennes features free WiFi . There is a shared kitchen at the property. You can play table tennis at the homestay. Braderie Lille is 2.1 km from Deffrennes, while Hospice Gantois is 2.1 km away. The nearest airport is Lille Airport, 5 km from Deffrennes. Sohosuite offers accommodation in Lille. Offering private parking, the apartment is 800 metres from Coilliot House. Free WiFi is available . The unit is equipped with a kitchen. A flat-screen TV is provided. There is a private bathroom with a shower. Braderie Lille is 900 metres from Sohosuite, while Printemps Gallery is 1.6 km from the property. The nearest airport is Lille Airport, 7 km from Sohosuite. Free public parking is available nearby and underground private parking is also available at a surcharge. Featuring free WiFi throughout the property, La-Lilloise is located in Lille, 1.5 km from Braderie Lille. Guests will find a shared lounge on the first floor, bedrooms are on the second and third floor. The Grand Place of Lille is 2 km from La-Lilloise, while the Old Lille District is 2.5 km from the property. The nearest airport is Lille Airport, 10.5 km from La-Lilloise. Situated in Lille, a 4-minute walk from the Halles de Wazemmes, Wazemoff offers guesthouse accommodation in a building dating back to 1850. It features free WiFi throughout the property. It is 450 metres from Gambetta Metro Station and 3 km from Gare Lille Flandres Train Station. Situated on the 2nd floor, the accommodation features a living room, dining room and kitchenette. Guests have access to a private bathroom fitted with a shower, bath and hairdryer. Extras include complimentary toiletries. Restaurants and shops can be found within walking distance. Free bikes are available for guest use and Zoo Park of Lille is 1.4 km from Wazemoff. The nearest airport is Lille Airport, 7 km from the property. La Fermette de Christine is set in Vendin-le-Vieil. Complimentary WiFi is featured. The holiday home includes 2 bedrooms, a kitchen with a dishwasher and an oven, as well as a coffee machine. A flat-screen TV is available. Lille is 34 km from the holiday home, while Arras is 25 km away. The nearest airport is Lille Airport, 29 km from La Fermette de Christine. Offering free WiFi and city views, Gite Salengro is an accommodation set in Vendin-le-Vieil. Guests staying at this holiday home have access to a fully equipped kitchen. The holiday home is equipped with a TV and 2 bedrooms. Lille is 34 km from the holiday home, while Arras is 25 km from the property. Lille Airport is 29 km away. Set near the Gambetta Métro station, in the city centre of Lille, this hotel-restaurant welcomes you 1 km from the Fine Arts Museum, 2 km from Lille Grand Palais and 300 metres from the Maison Folie de Wazemmes. The Best Hôtel Lille is ideal for both business and leisure stays. It offers easy access from the main roads, secure, covered parking, and a restaurant serving buffet food. The rooms are all equipped with a working area with high-speed, free Wi-Fi. Nouveau Siècle Convention Centre is 1.6 km away. Situated in Lille in the Nord-Pas-de-Calais region, Maison Victor Hugo has a terrace. It provides free WiFi and a garden. Guests can also relax in the shared lounge area. Coilliot House is less than 1 km from the homestay. The nearest airport is Lille Airport, 10 km from the property. Located in Lille, 500 metres from Coilliot House and 700 metres from Braderie Lille, A la recherche du temps perdu offers city views and free WiFi. Every unit features a satellite flat-screen TV, a fully equipped kitchen with a dishwasher, and a private bathroom with a shower and a free toiletries. An oven and microwave are also offered, as well as a coffee machine and a kettle. Printemps Gallery is 1.7 km from the apartment, while Zoo Park of Lille is 1.9 km from the property. The nearest airport is Lille Airport, 9 km from the property. Appartement Lumineux offers accommodation in Lille, a 3-minute walk from Canteleu Metro Station, providing access to Lille Flandres and Lille Europe Railway Station within 20 minutes by public transport. There is a seating area and a kitchen complete with a dishwasher and an oven. A flat-screen TV and DVD player are provided. Several shops and public transports can be found nearby the property. Braderie Lille is 2.6 km from Appartement Lumineux, while Printemps Gallery is 2.7 km away. The nearest airport is Lille Airport, 9 km from Appartement Lumineux. Appartement Plaisance is an accommodation situated in Lille, 1 km from Zoo Park of Lille and 1.2 km from Braderie Lille. This property offers access to free WiFi. The apartment has a satellite TV, 1 bedroom and a living room. The accommodation is equipped with a kitchen with an oven and a microwave. Popular points of interest near the apartment include Printemps Gallery, Coilliot House and The Old Lille District. The nearest airport is Lille Airport, 10 km from the property. Located in Lille, 1 km from Zoo Park of Lille, A & V Appart'hôtel offers accommodation with free WiFi. All units come with a seating area, a flat-screen TV and a fully equipped kitchen. There is a private bathroom with bath or shower and free toiletries in each unit, along with a hair dryer. Braderie Lille is 1.2 km from the aparthotel. Lille Airport is 10 km from the property. Studio Colbert is located in Lille. The Zoo Park of Lille is within 1 km of the apartment. The apartment has 1 bedroom, a flat-screen TV with cable channels, an equipped kitchen, and 1 bathroom with a shower. Braderie Lille is 1.4 km from the apartment, while Printemps Gallery is 1.7 km from the property. Lille Airport is 12 km away. StudioLille - Rue d'Anvers is located in Lille. Free WiFi is available. Each accommodation unit includes a seating area with a flat-screen TV, a kitchen with a dining area, and a private bathroom. An oven is also provided, as well as a coffee machine and a kettle. Braderie Lille is 300 metres from the apartment, while Coilliot House is 700 metres from the property. Lille Airport is 9 km away. Located just 4 km from the centre of Lille, Chez Jeanne et Vittorio offers B&B accommodation in a property dating back to 1886. Canteleu Metro Station is 100 metres away. All rooms feature a flat-screen TV with cable channels, a wardrobe, desk and wooden flooring. The en suite bathroom includes a hairdryer. A continental breakfast is provided each morning at Chez Jeanne et Vittorio. Traditional, French restaurants can be found in the city centre. Additional features include a terrace, free Wi-Fi access throughout and free public parking at a location nearby. Lille Fandres Train Station is a 10-minute drive away and the Citadel is 3 km from the property. Residhotel Lille Vauban is ideally situated in the residential Vauban district, just a 20-minute walk from Lille Old Town. Free Wi-Fi internet access is available free of charge in the rooms. The property offers studios equipped with a kitchenette with Nespresso coffee machine, a flat-screen TV and a desk. Apartments fitted with a kitchen with Nespresso coffee machine, a dining area and a living area are also available. Each accommodation features a private bathroom. Breakfast buffet is available at a surcharge at Residhotel Lille Vauban. From your aparthotel, the 45 hectares of the Bois de Boulogne is just 10 minutes away by walk, while Lille Grand Place is 20 minutes from Residhotel Lille Vauban. Nouveau Siecle Convention Centre is a 20 minutes walking distance from the property. Only a 10-minute walk from Lille-Flandres TGV Station, Au Coeur du Jardin offers self-catering studios with free Wi-Fi access. Gambetta Metro Station and The Old Lille are both 300 metres and 1.7 km away. Set on the ground or on the first floor, the studios feature a bathroom with shower, hairdryer and free toiletries and a wardrobe. Extras include a flat-screen TV with satellite channels, and ironing facilities. Meals can be prepared in the kitchenette, equipped a microwave, fridge, stove and coffee machine. A furnished garden terrace is also at guests’ disposal at Au Coeur du Jardin. A bakery, a small supermarket and restaurants can be found less than 100 metres away. Natural History Museum and Fine Arts Museum are both 400 metres from the property. A theatre can be found 300 metres away, and private parking is available on site with a surcharge and upon request. Free public parking is also possible in front of the property. Featuring free bikes, chambre coin nature provides accommodation in Fromelles with free WiFi and lake views. This bed and breakfast features a garden. The bed and breakfast features a flat-screen TV. Lille is 23 km from the bed and breakfast, while Ypres is 30 km from the property. The nearest airport is Lille Airport, 29 km from chambre coin nature. Below here is the hotels map of Herrin. Names and details of Herrin hotels can be shown on the map clicking on the prices icons.